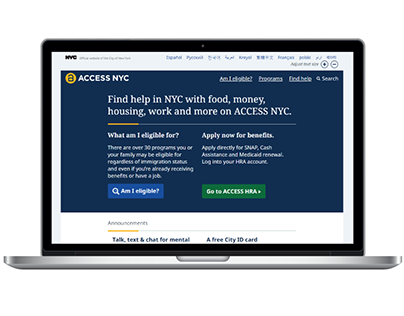 The Service Design Studio at the New York City Mayor’s Office for Economic Opportunity (NYC Opportunity) launched in October 2017, with support from founding partner Citi Community Development. 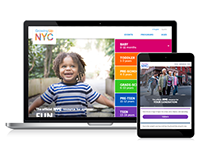 The Studio is an internal design consultancy available to New York City government agencies and is comprised of designers versed in design tools, experienced in developing in-person and digital services, and focused on addressing poverty-related challenges. 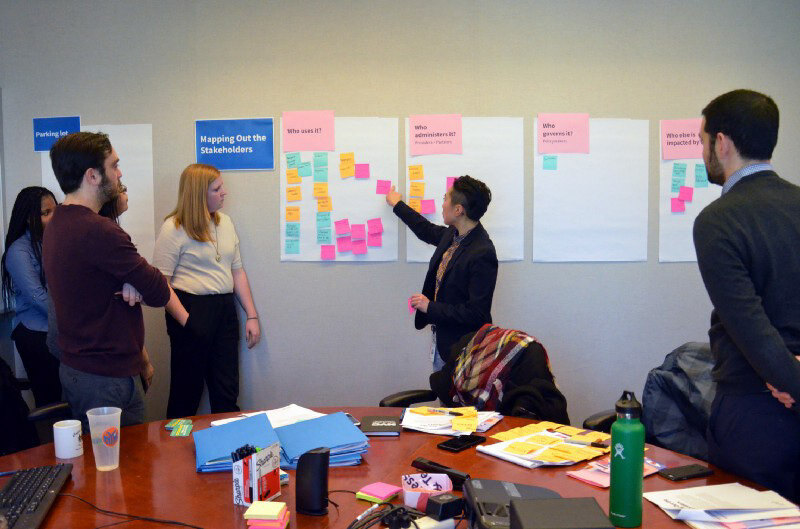 The Studio is the first-ever service design team within a municipal government dedicated to improving the lives of low-income residents in the United States. A core offering of the Studio is the Civic Service Design Tools + Tactics book, toolkit and website. These resources provide specific, tangible human-centered design methods tailored to complement and support the expertise of the people who develop and deliver government programs. The Studio led a design research process to inform the toolkit development through interviewing public servants who had been exposed to different levels of design, government innovation teams, and professional designers who focus on social impact. The main website connects to a Medium publication to allow more flexible and shareable content development. 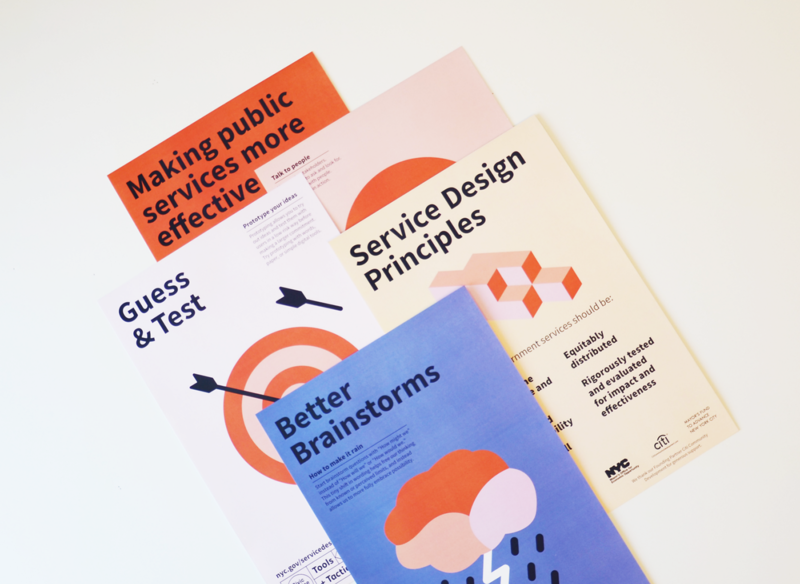 The Civic Service Design publication ( www.civicservicedesign.com) has individual pages for each tactic, allowing a more modular experience than the booklet or binder provides. Here, users can download worksheets and other resources related to the specific design method they are looking to incorporate in their work, and see the latest work and news from the Studio. As service design methods are a relatively new addition to the municipal landscape, it was critical that we create an energetic brand to draw in potential partners and clients. We distribute the book and toolkit in many different ways, but our most popular is via Office Hours, where city agencies and offices sign up to spend an hour with our designers discussing a particular issue that collaborative communication or co-designing with constituents might solve. To date we’ve held Office Hours with over 180 employees at 28 different agencies. We worked with the design firm Partner & Partners to develop the initial color palette, typography, logo mark and website for the Studio. The internal Studio team took these brand guidelines to create the Tools + Tactics book and toolkit resources. Adobe Illustrator, InDesign and Photoshop were utilized to create flexible designs for the various assets. The team has continued to expand and improve upon the brand portfolio since the initial inception, including the development of multiple presentation decks, social media assets, and new print materials. In addition to a strong web presence, a core part of our visual identity is a suite of posters and postcards that communicate the Studio’s principles. 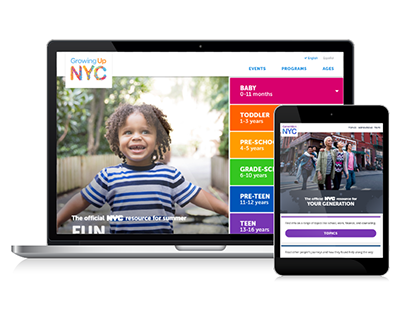 These assets are designed for government employees to hang in their cubicles to continue to spread the word about the Studio across the 70 agencies and offices that govern New York City. The Studio partners with agencies to deliver projects informed by a service design approach. 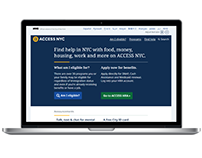 Designing for Opportunity pairs the Studio’s designers with New York City government agencies and offices for 6-12 months to work together on addressing challenges faced by low-to-moderate income New Yorkers. In January of 2018, the Studio ran an “open call for partnerships” to ask City agencies and offices to propose projects to work together on. The Studio created a campaign to promote the open call including a website, information packet, application form, and presentation decks. The Studio received 15 “Designing for Opportunity” proposals from nine agencies and offices. Primary themes in the proposals included access to services, youth services, housing, health, and education.